Finland celebrated its 96th Independence Day yesterday. This year, the festivities altered from the traditional ones, of which I wrote last year. Due to the renovation at the Presidential Palace, President Sauli Niinistö hosted the celebrations in Tampere. A new element was introduced: a 50-minute concert, a mixture of music and texts from Finnish classics. This change added a new layer to the Independence Day. Not only could we be thankful to all the veterans and lottos, but also we could be proud of our original culture and the arts. At least for me, no other art form touches my heart the same way as music does. No wonder I had tears in my eyes, when listening to Maria Ylipää and Waltteri Torikka performing "Myrskyluodon Maija". In fact, when working as a fundraising professional in the field of arts, I only work for arts organizations and artists, that touch me emotionally. "Don't work for a cause you don't believe in", stated Timothy Higdon, one of my New York University professors. The same applies to my daily work at Helsinki University's Faculty of Medicine. It is important to find touching stories of how has top-notch medical research helped people. Even the new Children's Hospital in Helsinki would not survive without medical research and new, breakthrough ideas in treatment and prevention. Santtu-Matias Rouvali acted as the conductor for the orchestra. This young fellow has climbed to the international conductor scene extremely rapidly, being only 28 at the moment. But who remembers him from the TV show "Not Born to Rock", which aired between November 2007 and January 2008? Four classical musicians were gathered together to form a rock band, and to play instruments, which were not their own instruments. 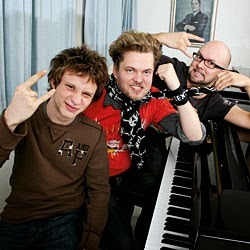 Santtu-Matias Rouvali (left) at the TV show Not Born to Rock. The picture is from Katso magazine's website. The Independence Day concert was important also in other ways: it showed the power of collaboration between art forms. Not only was there music, there were texts from Finnish literature classics, performed by actors. This kind of collaboration is highly crucial in the future. Arts organizations need to combine forces and find new ways to get the audience interested.